Should I Replace My Existing System? This can be a difficult question. If your furnace or boiler is older than 20 years, chances are it is probably oversized, inefficient, and likely to fail soon (a typical forced air furnace will last less than 25 years, though some boilers can last twice that long). With the guidance of a good contractor, replacing it with a modern high-efficiency model is a good investment. Old coal burners that were switched over to oil or gas are prime candidates for replacement, as are gas furnaces without electronic (pilotless) ignition or a way to limit the flow of heated air up the chimney when the heating system is off (vent dampers or induced draft fan). If your furnace or boiler is 10–20 years old, the decision to replace it depends on its age, size, condition, and performance. If you can’t seem to stay comfortable or keep your heating bills down, the best first step would be to hire a highly qualified home performance or heating contractor who can help you evaluate your existing system within the context of your home and determine the best actions to take. In some cases they may find that your furnace isn’t the problem, but rather your ceiling insulation, windows, or ducts need some help. It may be that a component of your system was improperly installed or needs a good tune-up by a certified technician (more about that later in this section). The energy auditing page provides more information on hiring home performance contractors and energy auditors who can help. If you heat with electric resistance heat, rising electricity prices may force you to switch to a gas, oil, or heat pump system that is more affordable. But it is important to carefully evaluate these fuel trade-offs (read more under “Fuel Options”), because fuel switching can be expensive. If you currently have a gas- or oil-fired furnace or boiler and know its rated efficiency, it’s pretty easy to calculate the savings you will get by replacing it with a more efficient system of the same type, assuming both the old and new systems are correctly installed. The chart below will help you determine the potential savings resulting from replacement of your existing system. If you don’t know the annual fuel utilization efficiency (AFUE) of your system, ask your heating service technician or energy auditor. The numbers in the chart assume that both the old and new systems are sized properly; savings will be greater than indicated if the old system is too large. Also, keep in mind that other system deficiencies will impact your overall savings. For example, most duct systems are not properly installed; unless you’ve had your ducts checked, 20% of the heat generated by your furnace is likely wasted through duct leakage. If so, it would be more cost-effective to put your money where it counts and make sure your ducts are repaired and sealed by a highly trained contractor. Depending on how old your system is, you may be able to use the rest of the money you would have spent to make a more modest efficiency upgrade to get the same level of savings. To estimate savings using Table 4.1, find the horizontal row corresponding to the old system’s AFUE, then choose the number from that row that is in the vertical column corresponding to the new system’s AFUE. That number is the projected dollar savings per hundred dollars of existing fuel bills. For example, if your present AFUE is 65% and you plan to install a high-efficiency natural gas system with an AFUE of 90%, then the projected saving is $28 per $100. If, say, your annual fuel bill is $1,300, then the total yearly savings should be about $28 x 13 = $364. If you expect fuel prices to continue rising, you would expect even larger savings in the future, and vice versa. That’s a lot of money to save each year, especially when you consider the expected lifetime of a heating system, but it still doesn’t answer the question of whether or not replacing the system is a good investment. ROI = $364 ÷ $2,500 = 0.14 = 14% – tax free! A 14% return is pretty good — much higher than what you receive from a savings account or certificate of deposit. Plus, unlike most other investments, energy conservation investments are tax free. If fuel prices go up, the annual savings and return on investment also go up. For example, if fuel prices increase 30%, the annual savings in this example increases to $473, and the return on investment increases to 19%. While you’re doing the math, don’t forget that some states or utilities (or even the federal government) may offer tax incentives or rebates that will reduce the purchase price of high-efficiency heating equipment. Be sure to check with your local utility and state energy office to see what incentives are available. So you’ve decided to buy a new heating system. While it is useful to understand what fuel, distribution, and equipment options you want to consider, the first step in selecting a new system is finding a knowledgeable and reliable contractor who can help you navigate the choices outlined below. It is paramount that the system is properly installed to ensure safety, reliability, and maximum efficiency. You’ll spend a lot of money to have a new furnace or boiler installed — anywhere from about $2,000 for a simple furnace installation to over $5,000 for a complicated boiler installation. A complete new system, with a new air conditioner and routine duct improvements, may cost over $7,000 for a proper job with good equipment, at least in high labor-cost regions. Any modifications to the distribution system will add significantly to the cost. To get the best deal, you should get bids for the price of equipment and installation from several contractors. It isn’t unusual for bids to differ by as much as $1,000, so get at least two or three bids. Try not to let the lowest price be the main reason for selecting a contractor. Better contractors might charge more, but they may offer greater value. When evaluating bids, also look at what you get for the price: quality, energy savings, and warranty. Extremely low bids may not include all routine services and customary warranties. Ask the contractor if he or she has had any special training in high-efficiency equipment. A well-trained, up-to-date contractor will not try to discourage you from purchasing high-efficiency equipment. If you think your old heating system is covered with asbestos insulation, make sure the contractor knows about it and will follow the proper procedures to deal with the asbestos. If you are not familiar with the contractor, ask for customer references and follow up on them. Make sure the contractor is fully bonded and insured. A good bid should be submitted to you in writing following a site visit and should include the proposed new equipment, what work is required, and the full cost, including labor. Do not give your business to a company offering to give you an estimate over the phone without ever looking at the job to be done. You should expect a home evaluation including an inspection of your current system and a heat-load calculation. As explained below, the size of the new system should be based only on this analysis, not on the current equipment. Using the calculation, the contractor should also be able to estimate what your energy bills are likely to be with the proposed system. A good contractor should ask about any heating problems you have had with your old equipment and offer suggestions for addressing these issues. A number of tests can be performed on your existing system to diagnose problems and determine if a new system is recommended. These tests are detailed under “Upgrading Your Existing Heating System” (p. 89). Finally, reliable contractors are professional. Their people are prompt and courteous. They should have a published office or shop address. An office or shop is an indication that the company has been in business and intends to remain in business. 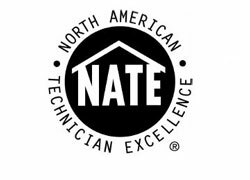 To find a heating contractor you can trust, consult the list of contractors certified by North American Technician Excellence. The Geothermal Heat Pump Consortium lists contractors that specialize in ground-source heat pumps. A new heating system must be installed properly to ensure safe and efficient operation. This includes making sure that any new ductwork or piping is properly sealed and insulated. Where possible, heating equipment should be installed within the thermal envelope of the house to minimize heat losses to the outside. For ground-source heat pumps, proper installation will have to depend on the conditions of your house and lot. The first step, as with all systems, is to find a well-qualified contractor who has installed many of these systems. This can either be an HVAC contractor who will subcontract the in-ground heat exchanger installation to a driller or excavator, or a driller who will subcontract the HVAC side of the project. You want one contractor to be responsible for oversight of the whole installation and its performance. With oil-fired furnaces and boilers, the system should be tuned and a combustion efficiency test performed after installation. Make sure the combustion efficiency meets the specifications (a calculation to convert from combustion efficiency to AFUE may need to be made). Gas furnaces and boilers come pre-adjusted from the factory and don’t require a combustion efficiency test, but a good contractor will perform a few tests as a matter of course, including a CO (carbon monoxide) check. If you are installing a condensing furnace or boiler (typically at least 90% AFUE), make sure it is properly vented per the manufacturer’s requirements, and a condensate pump or drain has been installed. The drain tube should run into a floor drain or sanitary sewer line. Condensing furnaces and boilers typically employ a sidewall PVC (plastic) vent instead of venting through the chimney. If a chimney is used, the PVC should extend to the top, so no galvanized metal is exposed to the slightly acidic flue gas. Most condensing furnaces and boilers have sealed combustion, which is safer and better for indoor air quality. If you’re buying a new heating system, the second decision (after the contractor) is what type of fuel to use. If you have an existing system, it usually makes sense to stick with the fuel your old system used, because the rest of the system will already be in place. But sometimes it makes sense to switch fuels. Comparing cost. Table 4.2 demonstrates the true cost of different fuels per unit of useful heat delivered to the space. As a general rule, it is more costly and harder on the environment to heat with electric resistance heat, which includes electric furnaces, baseboard heaters, and portable space heaters. Electric resistance converts incoming electric current directly into heat, which means onsite efficiency is very high and there is less pollution near the house. But, as illustrated in Energy and the Environment, when the inefficiency of electricity generation by the power company and transmission losses are taken into account, it is actually pretty inefficient to heat with electric resistance. Roughly one-third of the heating value of the fuel burned in a power plant will be delivered as useful heat in your house — the remaining two-thirds is lost to generation and transmission inefficiencies. Switching between oil and gas. Switching from oil to gas or vice versa based on current prices in your area can be risky. Even though one may be cheaper today, we expect their prices (per unit of heat energy) to converge, because so much of industry can use either fuel, depending on short-run price projections. Usually, fuel oil (and propane) prices fluctuate more quickly than natural gas. Using electricity. If you currently have electric resistance heat, switching to gas or oil will probably save you money. Electric heat pumps can be more expensive than oil or gas heat in most of the country, because operating costs are highly dependent on proper installation. Of course, in warm regions the use of a heat pump for cooling can help justify its use for heating through milder winters. When to choose a heat pump. Heat pumps are far more energy efficient than electric furnaces, and they can be used both for heating and air conditioning. But before deciding to replace your present system with a heat pump, you should carefully look into whether it makes sense in your climate. Because air-source heat pumps rely on the outside air as the heat source in the wintertime, the colder that air, the worse the energy performance (the lower the coefficient of performance, or COP). For this reason, air-source heat pumps make more sense in warmer climates, where summer cooling loads are considerable. As the industry matures, we expect to see equipment and installations that are better suited for northern climates, and some heat pumps “tuned” for cold climates are on the market now. Because temperatures underground are nearly constant year-round — warmer than the outside air during the winter and cooler than the outside air during the summer — a ground-source heat pump can be much more efficient than an air-source unit and appropriate for both warm and cold climates. However, they are less common than air-source heat pumps and usually more expensive to install. Despite the high cost, your energy bills might be lowered enough with a ground-source heat pump to justify installing one, especially if you need to replace your water heater as well. Most ground-source heat pumps are installed with a “desuperheater” that uses waste heat to heat water for no added cost during both heating and cooling modes. In addition, since the heat exchange pipes are underground and protected from the elements, ground-source units require less maintenance than conventional heat pumps, and there is no outside noise typically associated with conventional heat pumps and air conditioners. Did You Know? Ground-source heat pumps are easily 25–45% more efficient than new air-source heat pumps. Several utilities, in cooperation with government agencies and other groups, have begun marketing ground-source systems as a superior alternative to air-source heat pumps, especially for new housing, where the cost and disruption of burying heat exchange coils is not as great as in replacement installations. In some cases, you might want to change from one type of distribution system to another. If you have steam heat, for example, switching to hot water may make sense. Some two-pipe steam systems can be retrofit for hot water heat. Discuss this possibility with the heating technicians you talk with. If you have a forced warm-air or hot water system, though, it rarely makes sense to switch to something else. The cost of adding either new ducts or new piping will probably make the project prohibitively expensive. In old houses that were not originally constructed with central cooling, many homeowners have opted to tear out the old radiators and install a central forced-air system that can provide both heating and cooling. This can be a smart upgrade, but it deserves careful consideration. If the radiators are meeting your current comfort needs, it may be more efficient and cost less to keep your heating and cooling systems separate, since water transports heat so effectively. On the other hand, if you could benefit from the heat distribution and air filtration advantages of a forced-air system, then installing one may be a good way to solve a number of comfort concerns in one step. Before you actually start shopping for a new furnace or boiler, it pays to figure out how large a system you need. A system that is too large wastes fuel and money because it keeps cycling on and off. It only runs at peak efficiency for short periods of time and spends most of the time either warming up or cooling down. Many systems that were installed in the 1950s and 1960s are much too large, and the equipment may not have been downsized with subsequent replacements. It is not uncommon for a heating system to be two or three times larger than necessary. Did You Know? To be most efficient, your heating system should run virtually continuously on the coldest day of the year to keep your house at 70°F. Remember, how much heat you need depends on how big your house is and how well it keeps heat in. Never figure out how big a system you need by checking the size of the old system. If your heating contractor wants to do this, take your business elsewhere. A heat loss analysis is the only way to determine the proper size of a new heating system. (Steam systems are an exception: the boiler should be sized to the radiators.) A heat loss analysis can be done by your heating contractor or energy auditor; it should include measurements of wall, ceiling, floor, and window areas and account for insulation levels and weatherization features, including any energy improvements you have made. From the heat loss analysis, you need to know the peak hourly heating demand in Btu/hr on the coldest expected day of the year in your area. Furnaces and boilers are rated according to their Btu/hr output or heating capacity. A new heating system should be sized no more than 25% over the peak hourly heating demand. For example, if your home’s peak hourly heating demand is calculated to be 60,000 Btu/hr, you should select a heating system with a heating output between 60,000 and 72,000 Btu/hr. The minimum acceptable heat loss calculation is called an ACCA Manual J. Contractors with the technical capability to properly install modern systems should routinely perform this calculation. Ask to see a copy of the heat loss and system sizing calculations so that you can make sure they were thoroughly done. When shopping for a high-efficiency furnace or boiler, buy a system with a good warranty and a reputable company to back it up. Most quality furnaces have a limited lifetime warranty on the heat exchanger, and most hot water boilers come with a 20-year warranty. The controls should have at least a one-year warranty. If the manufacturer is a relatively new company, ask the dealer about the company’s reputation. Ask for the names of several homeowners in your area with their systems in place, and call to see if the homeowners are satisfied with performance and service. The efficiency levels you want to look for vary according to the type of system and fuel, as indicated in Table 4.3. If you live in a cold climate and your house is well sealed, it usually makes sense to invest the extra few hundred dollars for the highest-efficiency system available. In the mildest climates with low annual heating costs, the extra investment required to go from 80% to 90–95% efficiency may be hard to justify. Also remember that if your ductwork is not properly sealed, choosing a 95% over a 92% AFUE furnace is probably not worth the money. Invest in duct sealing instead. High-efficiency oil- and gas-fired systems—over about 85% AFUE— are typically condensing models. By wasting less heat as hot exhaust gases, you keep more money in your pocket. We recommend asking for units with sealed combustion. This means that the furnace or boiler draws in outside air for combustion, instead of using heated air from inside the house. The Air-Conditioning, Heating, and Refrigeration Institute publishes product directories for furnaces and boilers. The amount of electricity drawn by a furnace to power its motors and blow air through the house is often overlooked, since we focus on the natural gas or fuel oil used to make the heat. However, the electric energy demand by the furnace can be considerable — over 1,200 kWh/year for some models, adding up to $100 or more to your yearly electric bill compared to models with an efficient air handler. How much electricity a furnace uses depends on the design and configuration of the unit, the efficiency of your ducts, and most importantly, the efficiency of the motors and fans. The actual amount of electricity used by any furnace will vary with your local weather and house characteristics, such as the efficiency of your ducts. As noted above, the most important variable is the fan motor type. Most units today use “permanent split capacitor” motors, but premium units are often equipped with variable speed fan motors, also called “ECM,” or “permanent magnet DC” motors. These motors are more efficient than conventional furnace fan motors at high fan speed (air conditioning). They are much more efficient at the lower speeds that are generally used for heating and air circulation. Variable speed motors also allow finer control and some premium features such as enhanced dehumidification in the cooling season and quieter air circulation when neither the heating nor the air conditioning is on. These can be very cost-effective where the furnace or central air conditioner runs many hours, or where the homeowner uses the fan to circulate air through the house and filter, regardless of whether the system is calling for heating or cooling. On the other hand, actual savings may be relatively small in regions with low space conditioning loads. Ask your contractor for information on the type of fan and estimated electricity use of the fan included in any system recommended for your home. The Gas Appliance Manufacturers Association gamanet.org) notes electrically efficient models in its furnace listings. Make sure your installer has experience with high efficiency systems. Ready to shop for a thermostat? Visit the Enervee Marketplace, featuring a zero to 100 efficiency score on each model, personalized energy bill savings & total cost of ownership, available utility incentives, aggregated product reviews – and the best retail prices.